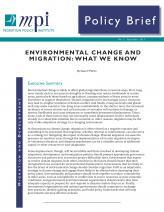 Environmental change is likely to affect global migration flows in a number of ways. Both long-term trends such as increased flooding and the increasing scarcity of resources as well as shorter term trends like severe weather are likely to contribute to displacement and increased migration for individuals already in vulnerable situations. While often viewed as a negative outcome of climate change, planned migration can also serve as a strategy for mitigating its impact. Internationally, immigration policies should prepare appropriate governance structures and policies now to prevent greater difficulties later. National governments and international bodies need to act together in a collaborative planning process involving the sharing of best practices and the development of guiding principles for policymaking to ensure migration -- both as a result of environmental change and as an adaptation strategy itself -- is adequately incorporated into their planning. This brief describes a variety of ways in which environmental change may affect migration, current policy responses to climate migration, and provides recommendations for policy planning. A. What Will Environmental Migration Look Like?